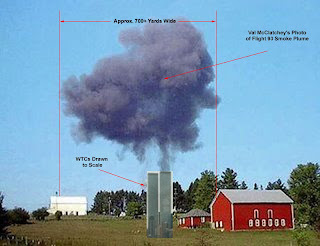 I just did a couple of quick graphics showing the scale of the Flight 93 "smoke plume" in relation to the size of the WTCs. 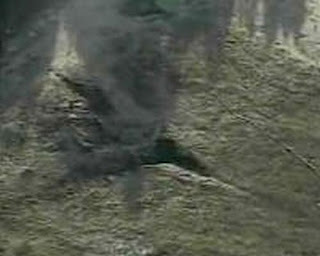 Val McClatchey claims to have taken this photo within seconds of the crash of Flight 93 iin Pennsylvania. Killtown originally did an analysis of the size of the smoke plume, which I confirmed. 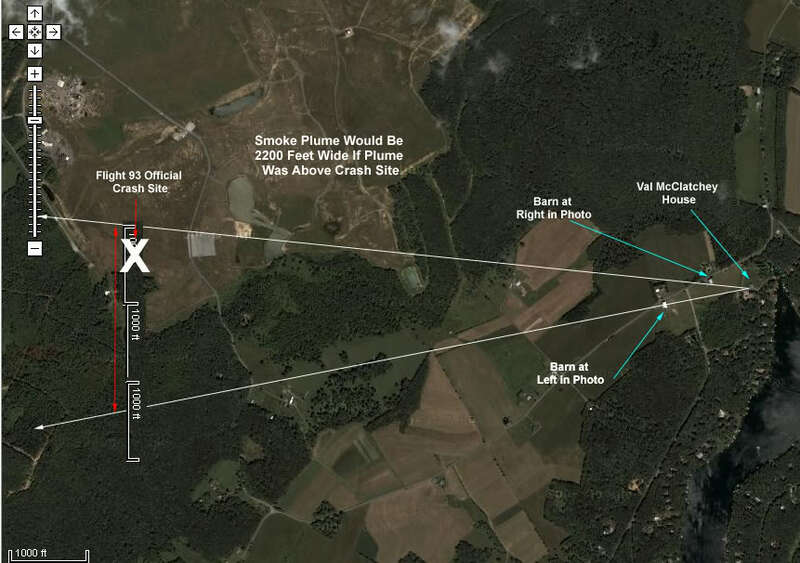 If the smoke plume was at the crash site, it would be 2200 feet wide (give or take!). Here's what the McClatchey plume would look like if it were over NYC. 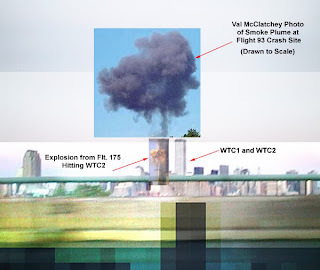 Notice how small the explosion in WTC2 is compared to the size of the smoke plume from the McClatchey photo. Q: How could the crash of Flight 93 have created a smoke plume so large??? *Note: Officially Flight 175 supposedly crashed with 65% more fuel left than Flight 93 supposedly did (9,100 gal vs. 5,500 gal) and most of Flight 93 (past the cockpit section on back) had supposedly buried deep into the ground so fast that "it didn’t have a chance to burn." 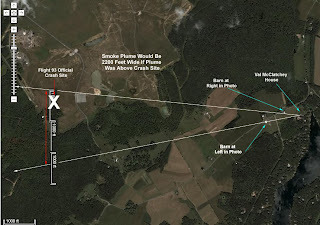 Q: How could Flight 93 have created this big of a smoke plume from the crash, and yet fail to burn the grass next to the crater it supposedly left?? *My addition to nick7261's post. the friggin thing has wing marks in the ground! the is a joke to them! sim-vic Yudh Jain's very name mean's War "Yudh" and Jain = follower of Jainism.